The Task Force police were mobilized on Monday morning in Tirupati. 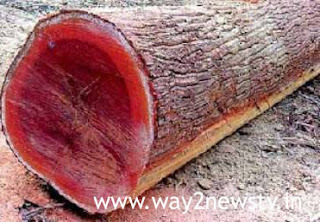 16 red sandalwood was seized in two areas. Two smugglers were arrested. A vehicle was seized. Task Force personnel were held near Tirupati Mangalam. A steering wheel of 9 reddish mines, which was moving in the forests of Mangalore, Two smugglers were arrested in the incident. At the KMM hospital, the RS Vasu team also seized another seven red sandalwood. Smugglers fled the vehicle after seeing the police. Bada smugglers came to light the latest bundles of money and throwing them into reddish smuggling. One of the two smugglers identified by Task Force Police near Mangalore, Ajith Kumar, a second year student at Thiruvannamalai University.